One of the best small form factor systems we've ever used. Corsair's first foray into complete system building is a triumph in both performance and design. Corsair has long been a trusted brand in the PC building world, known especially for its high-quality RAM, cases, and even keyboards. If you’ve built a PC in the last two decades, you’ve probably used at least one of the company’s products. But until now, the company has not forayed into offering complete, pre-built systems in the same way as companies like MSI and Gigabyte or custom build manufacturers like Digital Storm or Origin PC. The closest the company came in recent years was with the Bulldog—an ugly-as-sin "PC starter kit" case that included a mobo, PSU, and liquid CPU cooler, but made you supply everything else. Considering the company makes nearly every part of a PC, it’s only sensible that it would create a complete system. With the One, Corsair clearly establishes itself as a true pre-built system manufacturer—and it'll have a strong foundation to built upon from there. The One is a triumph in clean design, excellent performance, and small form factor. Measuring 7.9 x 6.9 x 14.9 inches, the One stands only a few inches taller than the Mac Pro, and with a look that's futuristic more by way of Tron than of dustbin. It has definitely earned a spot in our best gaming PC roundup. One of the most impressive things about the Corsair One is its cooling solution. Both the CPU and GPU are cooled by their own 240mm radiator. But rather than outfitting each of those with their own fans, the entire One is cooled by a single 140mm maglev fan up top that pulls cold air in through the radiators and exhausts it out the top. The result is a well-cooled system with a minimal footprint that runs whisper quiet. Overall design is impressively compact. Sure, you can build and buy mini-ITX systems that are small—smaller even, than the One—but Corsair utilizes every internal square-inch of the One to full effect. There’s no wasted space, and no addons for the sake of having frills. The One takes the best that Corsair has to offer, and distills things down into a very svelte machine. Did I mention it’s powerful? Packed inside is an Intel Core i7 processor, Nvidia 10-series GPU, and liquid coolers for both. CPU/GPU power, as well as storage size, varies by tier—the One starts at $1,800 for an i7-7700, GTX 1070, and 240GB SSD + 1TB HDD, and goes up from there. The unit I tested featured an i7-7700K, GTX 1080, and 960GB SSD for a retail price of $2,300. If you don’t like the specs, Corsair will offer several other options. 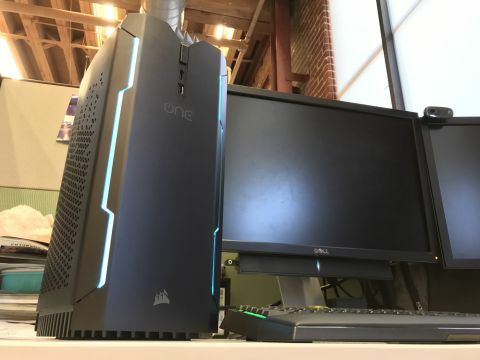 As you can see, the Corsair One more than delivers on the promise of excellent gaming performance in a small package. Even better, it does so without relying on large, loud fans to keep everything cool. I've played with small form factor systems before, and heat management is often their achilles heel. Not so with the One—performance remained stable even after running high-load benchmark tests one after the other. Of course, pre-built systems are known for adding a bit of price premium over the cost of building a rig yourself. But adding up the individual cost of everything packed inside the One, you reach a price not that much cheaper than the cost of the complete system—especially when you factor in the cost of Windows. Either way, Corsair brings a lot to the table here. For one, small form factor systems are especially tough to build inside, and the innards of the One are manicured with precision. Similarly, the One's custom chassis isn't the kind of thing you can easily recreate DIY-style. There's also the added benefit of a manufacturer's warranty—the One comes with 2 years parts and labor covered. But most of all, it's the ease of having a plug-and-play gaming system that looks great and performs even better, and some people just don’t want to build themselves. The One is a major milestone for Corsair. Having made components and accessories for decades, Corsair is now in a position to fuse all of its strengths together into one system. The One is a really exceptional culmination of everything Corsair does, and I’m excited to see more.